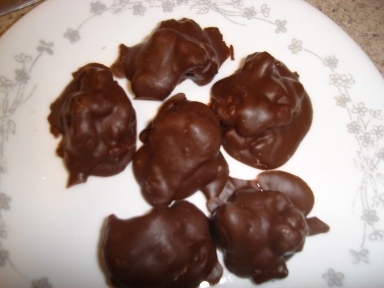 A gluten free casein free chocolate candy recipe for mock "Chunky" drop candy. The gluten free casein free chocolate candy recipe below is very similar to the Chunky bar. Be sure to use gluten free marshmallows and walnuts. Wal-Mart has the Great Value brand gluten free mini-marshmallows and the Ghiradelli semisweet chips that are gluten and casein free. They do contain a small amount of soy lecithin, so if you react to that you might have to find some Enjoy Life brand, which are completely soy free. 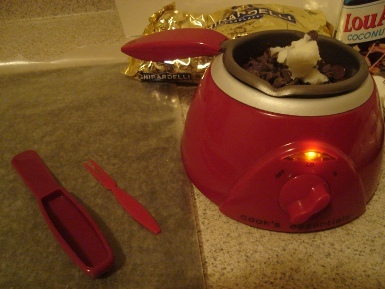 If you don’t currently have a melter or fondue pot, you can use a double boiler to melt the chocolate. It is not a good idea to try to melt chocolate over direct heat as it scorches very easily. Melting it in the microwave will work if you use low settings and do it a little bit at a time. It may alter the texture and flavor a bit though. Melt the chocolate chips and coconut oil together. Once melted, stir in the vanilla. Mix the walnuts, raisins and marshmallows in a small bowl until uniformly distributed. Pour about 1/3 cup of the melted chocolate over the mix, and stir well until all ingredients are coated. Drop by scant teaspoonfuls onto waxed paper. When all the ingredients are on the waxed paper, spoon just enough of the remaining chocolate over each one to cover. Allow to set in the refrigerator for 20 minutes. Makes about 20. If you have any chocolate left over, you can make gluten free casein free chocolate covered raisins or rice chex.